I am declaring today Smoothie Sunday. Because honestly smoothies are the laziest drink/snack/breakfast around. Truthfully, I never thought I would post a smoothie recipe because when I make smoothies, there is no recipe. Throw in a little of this, a little of that, oh and maybe some of that, in the blender and blend, blend, blend. But since my cousin Maggie requested a new smoothie recipe I wrote one down with pencil and paper. I figured I could come up with something good seeing as all I want to consume these days is mass amounts of fruit. I am putting them in every single dish I make. And maybe stock up on pineapple, all berries, nectarines, peaches, mangos and melons. 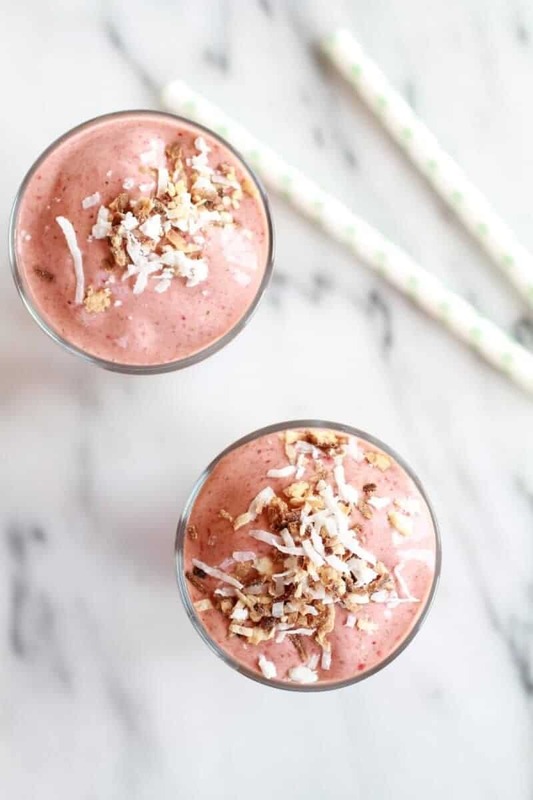 So this smoothie is like a pina colada loaded with tons and tons of strawberries, a frozen banana for creaminess and sweet coconut to tie it all together. For some protein I added some greek yogurt, but the second time I made them I added vanilla coconut ice cream. Ah huh, vanilla coconut ice cream. Both are good and if I was making this for breakfast I would probably go with the greek yogurt, but any other time of the day I would choose the coconut ice cream. Then it is kind of closer to a milkshake. Which is just as awesome since it is a pretty healthy milkshake and in my brain totally qualifies as a perfectly wholesome afternoon snack. Okay, fine maybe I made it for breakfast too. Oh and I even added some spinach to this guy. Granted not a whole lot since I did not want some gross murky looking smoothie, but hey a little spinach is still spinach. You can add more than I did if you want, but be warned the color will not stay pink. Or you can leave the spinach out all together, but I promise, you can’t taste it. 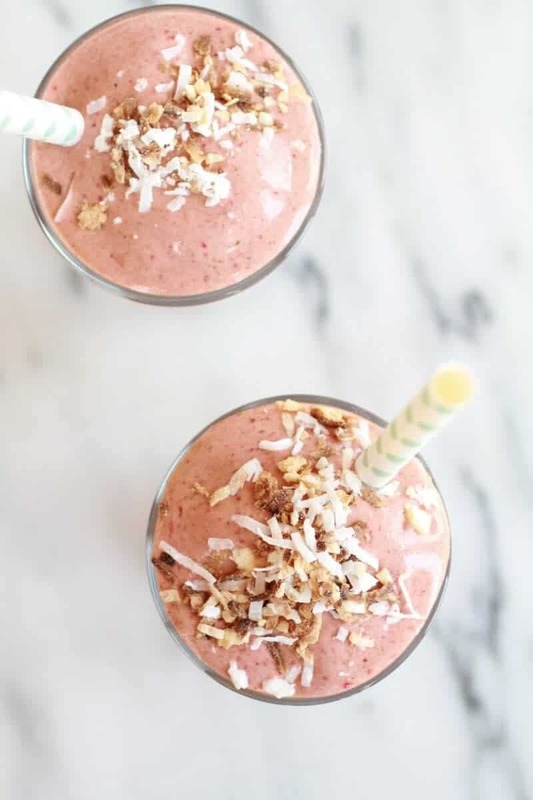 So this smoothie is like a pina colada loaded with tons and tons of strawberries, a frozen banana for creaminess and sweet coconut to tie it all together. Blend bananas and coconut milk until smooth. Add spinach, if using, and blend on a high setting until most of the spinach has been broken down into small pieces. Add the strawberries, pineapple, greek yogurt or coconut ice cream. Blend until the smoothie mixture is all one color. Add the vanilla and salt and blend until combined. 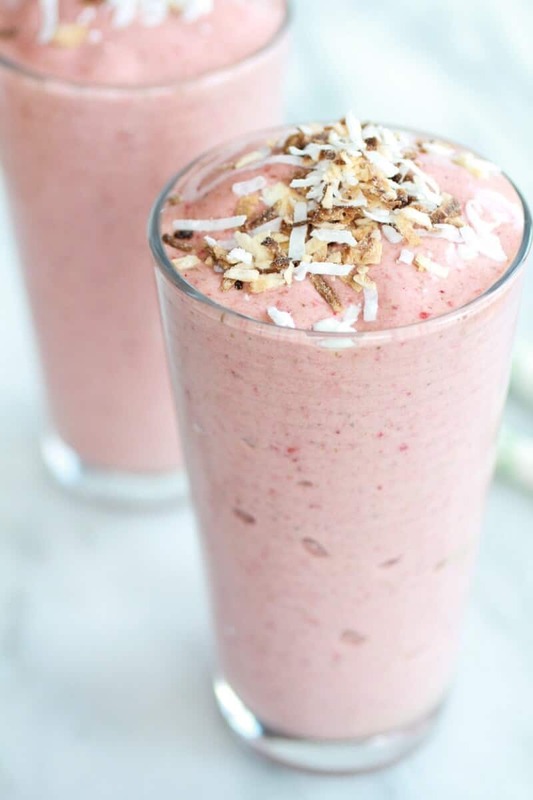 Pour the smoothie into glasses and top with toasted coconut. 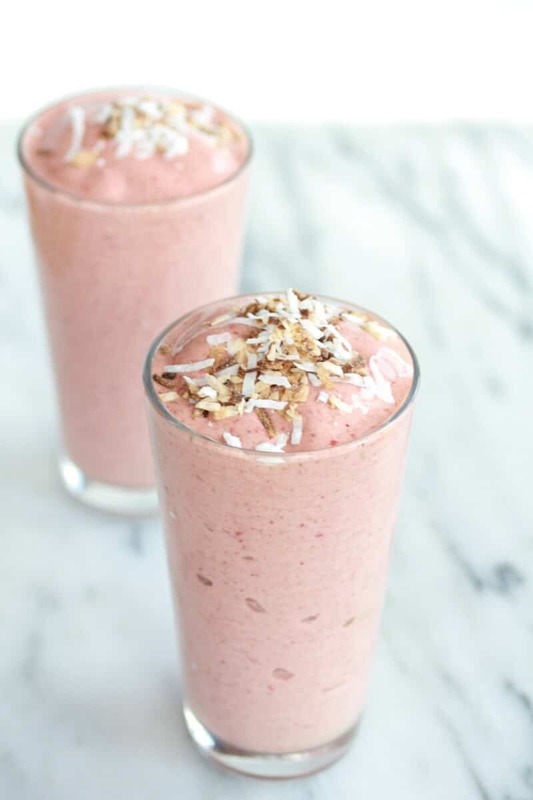 Yeah for lazy Smoothie Sunday! What kind of coconut ice cream do you use? I love anything that has coconut in it. Hi Kristi, I use the coconut cream from a can of coconut milk that has not been mixed up yet. Usually the coconut cream sits on the bottom of the can and the separated coconut water sits on top of the cream. For this recipe though I used the coconut milk. Meaning I mixed the coconut cream in the bottom of the can with the separated coconut water on top. I’m totally down for Smoothie Sunday! 🙂 I just had some plain cereal this morning and this smoothie sounds SO much better! Glad you are down with the smoothie sunday! Thanks Jennifer! Ooooh…let’s make this a thing 🙂 Looks delicious! 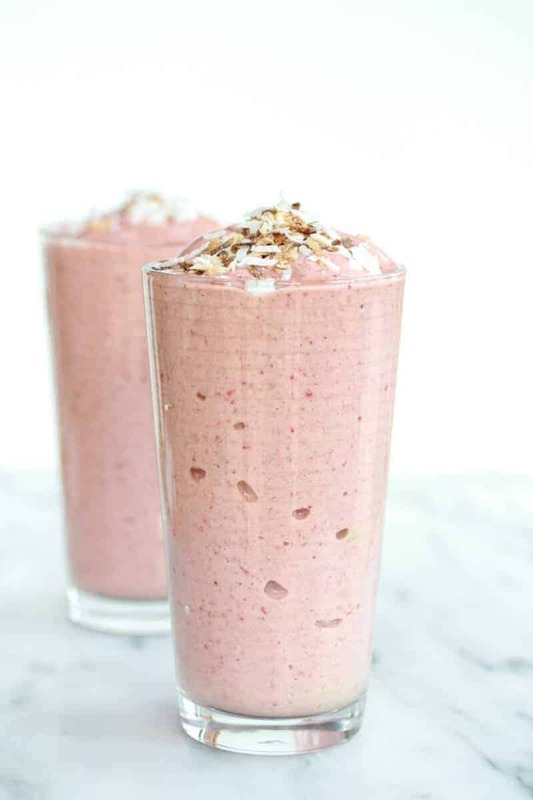 Smoothies are my Go-To lazy snack too … and kids think that they are getting a milkshake! 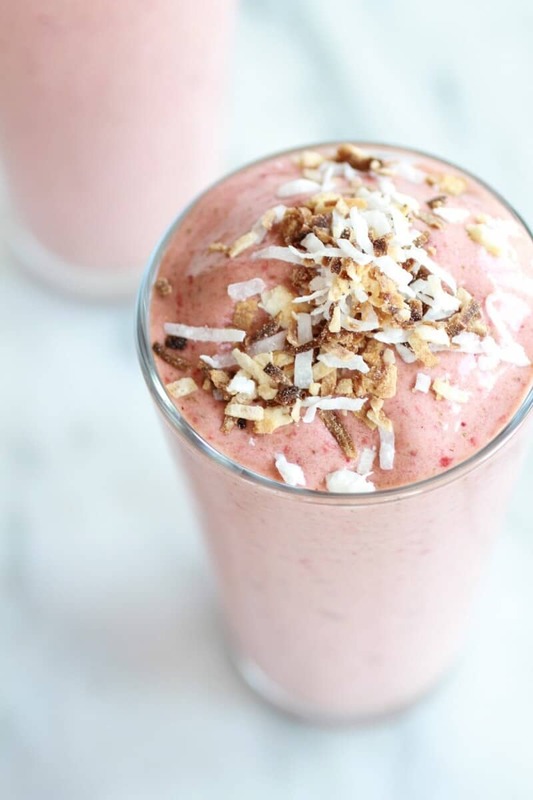 This Strawberry Colada Smoothie looks Awesome! 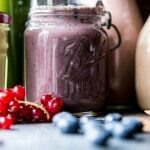 Smoothie sunday – I love it! I had my smoothie today 🙂 banana, strawberry, some spinach, and pineapple! Deeelicious. I have to add coconut milk next time! Haha! That is basically this smoothie! 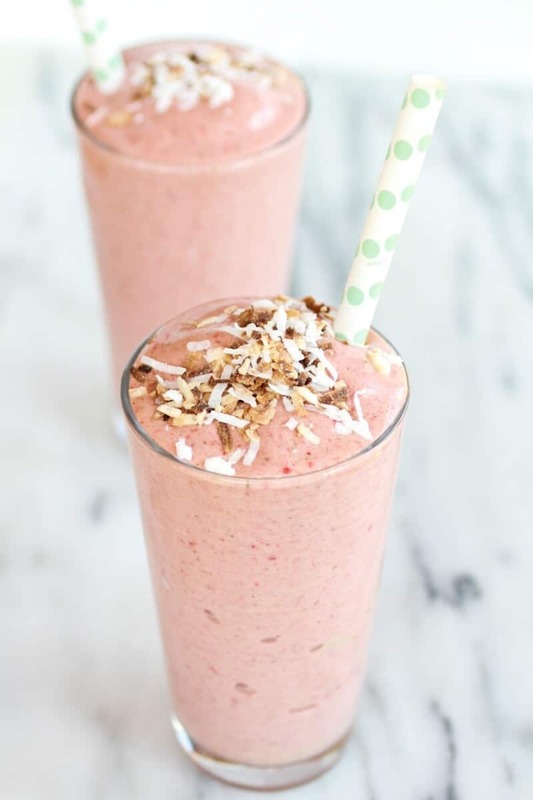 How about smoothie… Everyday?? Ha ha this is fantastic Tieg, can’t wait to make it!! I love coconut milk in smoothies. It’s my favorite way to get rid of leftovers in the fridge. This looks great! So basically, everything amazing is in this smoothie. Definitely going to be something I look forward to in my mornings! As usual your pictures are outstanding and your recipes to die for! Thank you for sharing! Came over a Pinch of Joy Party! hank you so much Lizy! You are too nice! A kindred spirit! Ice cream, when accompanied by this much fruit and even spinach(!) is totally a breakfast food. No argument. Yumm! 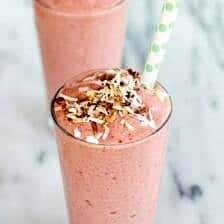 I’ve been enjoying smoothies for breakfast the last couple of days and the strawberry, pineapple, banana, and greek yogurt have been making for a killer drink! Yea! Smoothies are so good fro breakfast! Thank you, Christine! 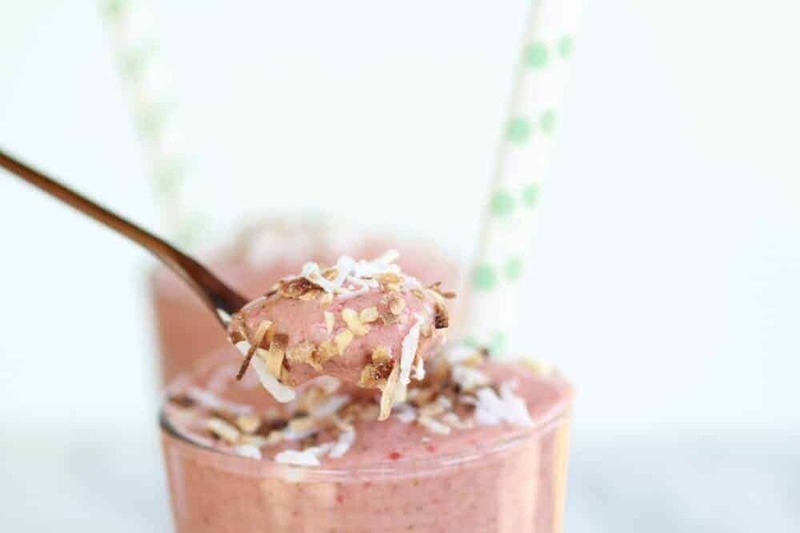 This smoothie is a super wonderful treat!! Thank you so much, winnie! I really need to get myself a blender or nutri bullet. Every time you post another recipe I want a smoothie so bad and this one sounds great. I love Strawberry!!! Vanilla coconut ice cream in this smoothie?? Yes pah-lease!! Sounds delish girl! Haha! Thank you, Jocelyn! The coconut ice cream was killer! 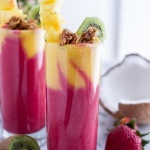 My absolute favorite is pina colada, but I never thought about adding strawberry! And Greek yogurt and spinach is sheer genius! I can’t wait to try this. Thanks for sharing on Marvelous Mondays! This is one of the best sounding smoothies ever. I love everything you’ve got in here, and I’m going to have to try it! Thank you, Marcle! It is so good! This sounds so good! All my favorite flavors together! Looks and sounds so good, just as all your other recipes. How come you at salt to a smoothie? I never tried that, is it for taste for this specific smoothie only? 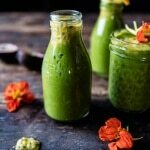 Spinach into a smoothie? This is definitely a wild idea worth trying! Added greens are always a good idea! lol! I hope you try it and love it, thanks Edi! what a neat combination. I would never have thought of salt ? great pics. Thank you Anna! It seems weird but I hope you’ll like it! 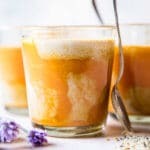 I love your smoothie recipes (this one included!!) It’s always a nice change from my usual combinations 🙂 Keep them coming!! Thank you so much Hannah! I am so glad you like this! This sounds amazing! What kind of coconut milk do you use (canned or from the dairy section)?